Yesterday I wanted to try out a "new" superpixel algorithm that seemed quite successful: SLIC superpixels. This is actually a very simple algorithm, basically doing KMeans in the color+(x,y) space. I'm a bit bummed that they named that, since I already tried the same approach a couple of years ago and didn't think it was very useful. Well, apparently it is. The authors have a nice website with some examples. Unfortunately the linux binary didn't run on my box and building on linux seemed somewhat non-trivial. So I did what I always do: wrote some Python wrappers. You can find them on github [update] I did an implementation for scikit-image which is now quite mature thanks to some other contributors. I would recommend using that instead if you want SLIC in python.[/update]. The whole thing is pretty small, easy to build and easy to use. Also damn fast (less than a second per image). There are two variations, one where you can specify the number of superpixels and one where you can specify the number of pixels in a superpixel. Both have an additional parameter, the "compactness", which is a trade-off between the similarity in colorspace and (x,y) space. Both are done in RGB colorspace and could probably benefit from going to Lab. The SLIC implementation converts to Lab, while I didn't do the conversion for quickshift (which I probably should have done). It seems to be a bit more than KMeans, as it seems that the clusters are spatially contiguous. The clustering step must be imposing some connectivity. Could it be a KMedoids? There's nothing in the code that seems to require contiguousness. Might just be the most common behavior. I don't understand why they only have to search 2Sx2S around each center. Couldn't a cluster be a region larger than diameter 2S if it were fairly homogenous in color? Even that probably has some hysteresis, though perhaps less than perturbing the centers each time a pixel changes labels. On your suggestion in the last paragraph. 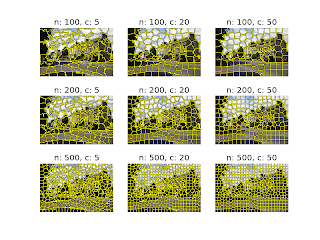 It is not enough to perturb boundary pixels. In some cases the boundaries stabilize, but there might be detail within a cluster that should be assigned to a nearby cluster. I know this because I am working on a new algorithm, similar to SLIC, but using a density estimation approach. Also, to represent these boundary positions programmatically is more complex than working with 2Sx2S rectangles centered on the cluster centers. 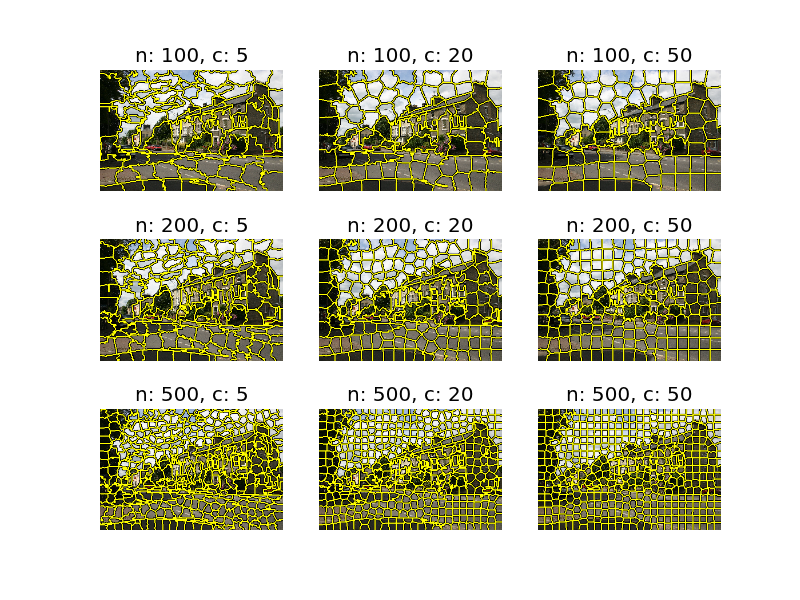 The edges might move with every iteration, possibly requiring a new scan of cluster allocation transitions for adjacent pixels over the whole image after every iteration. The original paper(s) for slic describe an "enforce connectivity" phase that follows the k-means clustering where regions are merged or relabeled to result in separate, contiguous connected regions for each label. The scikit-image implementation provides a parameter for turning on/off this enforce connectivity phase of the algorithm. The 2Sx2S search localized about each cluster center isn't something they "have to do". It's done to make the algorithm O(N). 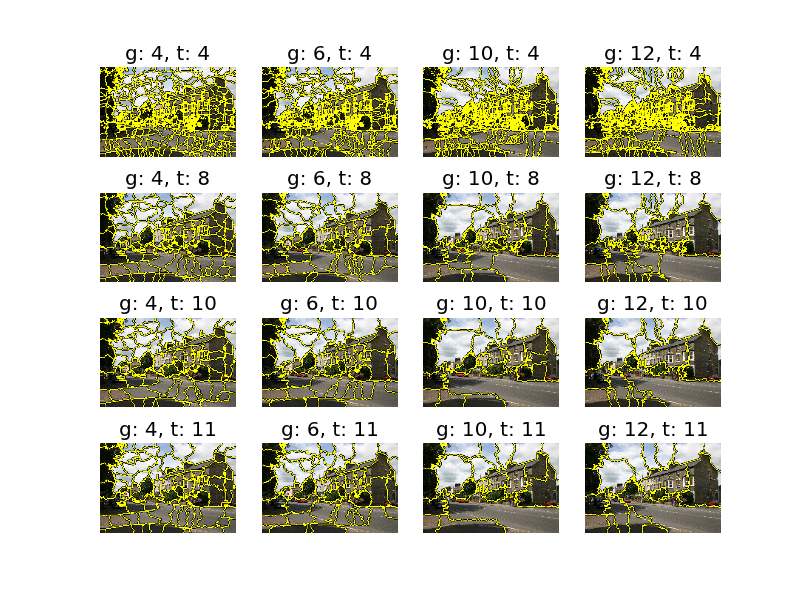 By constraining the search neighborhood about each superpixel center, the algorithm is much faster. Also, the example code does not use exactly the same function as in the paper. The code uses sqrt(dist_xy^2 + dist_lab^2), instead. That is true. Weird, though it probably doesn't make much difference. I must confess I haven't looked at the code in detail. In hindsight, it might have been better to wrap my own code. For the connectivity: As far as I understand it, this is more of a "cleanup" step. The clusters are not connected in the image space, but as a post-processing, each region in the image is assigned a label - so there can be more labels than clusters. Also, I noticed by default the edge perturbation is off. That doesn't seem like a good. I think the 2S is just a "good enough" approximation. It makes the superpixels even more compact (which is a desired property) and it makes the computations very efficient. Given N pixels in the image and k seeds. Typically, with the well known K-means clustering algorithm, K*N distances have to be evaluted. Using only pixels in the neighbouring area 2Sx2S, the number of comparison is reduced to 2Sx2S = 4S^2. As you know, S = sqrt(N/K), hence the total number of comparison is K*(4S^2) = K*4N/K =4N. Consequently, the complexity of the SLIC is only (o)N while kmeans algorithm has a complexity of (o)KN. In addition, prospecting in the 2Sx2S area around each cluster we allow us to guarantee that the spatial expand of each superpixel will never exceed 2Sx2S pixels (considered as compactness). Hi! Is there another way (e-mail?) I can contact you? I'd like to ask a few questions about this for our research project. Thank you! Hi! If I use the python wrapper, am I supposed to still be able to edit the SLIC.spp code? I've only tried putting a cout on the cpp, but it doesn't output anything when I run the python code. Thanks! Just a follow-up question, do the region_labels pertain to the image data of a single superpixel? Indeed, if you edit SLIC,cpp, the could should be executed. Are you sure you rebuild everything and the function is actually called? IIRC region_labels is an image sized array of integers indicating the superpixel memberships. Aren't the cpp functions called in the _slic.pyx? If region_labels indicate superpixel memberships then is it correct if I use Image.fromstring(region_labels[i]) to save a single superpixel into an image? Actually that's what I've been trying to do - "extracting" a single superpixel and saving it as an image. Thank you so much. Sorry for asking a lot of questions. 1) Some of the cpp functions are called. 2) No. There are several problems with this expression. But first, it is not clear to me what you are trying to achieve. Superpixels are not rectangular, so I don't see how you want to save an superpixel to an image without computing the bounding box. Coud can easily get the pixels associated with a superpixel using image[region_labels == i], but this will be a flat vector. As these are rather general programming questions, may I suggest you try stackoverflow? Hello, thanks for the Py binding! I experimented with it and it seems to work well and fast. But, when I run it on a list of several thousand images, the memory usage keeps increasing (memory leak somewhere) and eventually crashes (crashing the other memory demanding processes at the same time). This happened to me several times until I figured out the problem was due to a memory leak in slic-py. I haven't digged into the code to find out the problem yet. Do you have any idea or suggestion? Thanks a lot again. Did you use the newest version from github? I might have fixed something at some point. I don't have time to investigate now unfortunately. The algorithm is also implemented in scikit-image, but somehow the compactness there seems to be different than in the original implementation. 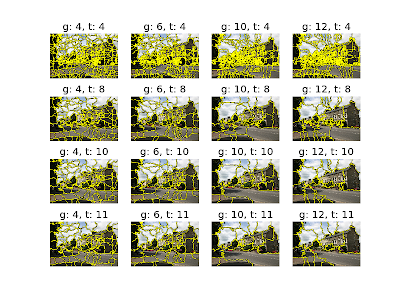 Ultimately I'd rather make the scikit-image implementation as good as the original one. Thank you for your lovely software! So I had to manually modify isspace(*ts) to std::isspace(*ts) in _slic.cpp, which now makes it work well.